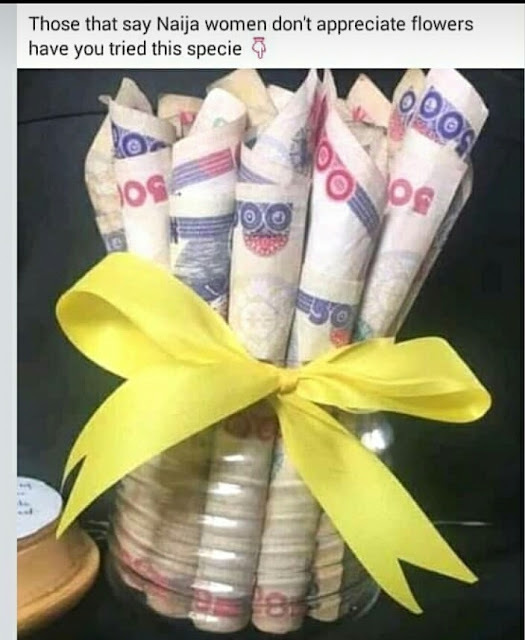 This title cracked me up 😁😁😂😂 posted by a Nigerian as it's believed that women here just love money. But it soon reminded me how ignorant gender stereotypes are...there are Nigerian ladies who love flowers to bits and will drool over them if given, yet they can't find men who believe they will love it...and there are men still who will buy flowers as gifts in Nigeria. Yes, there are. There are still Americans or other non-Africans who do not appreciate flower gifts...even though it's even a common practice in their clime, I spoke to one just yesterday. So it's just a personal preference vs what is largely done or practised, not a Nigerian hate. Dear men, find out if your babe loves flowers, then gift her them...no two women are the same, don't keep believing lies from ignorant stereotypes.